Our content creator program is filled with a very talented and dedicated group of people. Starting with this article, we are featuring them in a more prominent manner! If you’re unfamiliar with what our content creator program is, an introduction to the program can be found in this community blog. The first creator that we’d like to introduce to everyone is Swtorista! Swtorista has been creating videos and guides on her website for over five years now. Recently of note, she has painstakingly created and maintained a super-list of guides, covering a very wide range of topics. Her videos range from very informative breakdowns on topics, to where you can find some of the best-looking gear in the game. That’s just scratching the surface though. To kick things off, when did you start playing SWTOR? I started playing Star Wars: The Old Republic during the beta testing weekend before the game was launched! I'd heard about the game a few years before and was incredibly excited to find out there would be an online game like Knights of the Old Republic, or at least set in the same Star Wars era. Even before I got to play, I had joined a guild and was daydreaming about what class I would play and what my character would be like! What got you into being a content creator? I've always enjoyed creating guides and content ever since I started playing online games and realized how many people were out there who shared my hobbies. In Star Wars: The Old Republic, I started making guides for my friends and guildmates so we could work together in-game better by understanding all the different aspects of the game, like crafting or conquests. I've always really enjoyed checking out things other players have made as well - a few years after I started playing, I got really hooked on listening to podcasts. One of my favorite podcasts was hosted by two veterans of the game, so they often talked about current news or stuff they would do as veteran players. A listener called in and requested that they cover more new player topics too and I thought to myself, "Hey, I can do that!" At the time I also had a lot more free time, so I decided it might be a fun time to try and add video editing to my skill set... it was a tough road to learn from scratch but I've really enjoyed the learning and I feel like I learn something new every project I work on! Why do you make content? I'm incredibly lucky that I've met a lot of friends along the way who are patient, knowledgeable and kind when it comes to sharing knowledge about the game. I know not everyone is lucky enough to find a good guild or good group of players to team up with, and these videos are my way of appreciating all the help along the way and each one is written as if I was explaining something to a friend or guildmate. Having played the game since its launch, what would you say is your fondest experience or memory over its history? My fondest memories of playing SWTOR are almost always related to playing with my guild. One of my favorites was watching a friend turn on auto-run to get to the boss quicker in an Operation... and walking away from the computer, causing his character to run face-first into the boss and triggering the fight, all of us screaming and laughing on voice chat, and him returning to the chaos when he got back. With it being a few months away, do you have any plans on attending the Star Wars Celebration event hosted in Chicago? We've got big plans for Star Wars Celebration 2019 in Chicago! 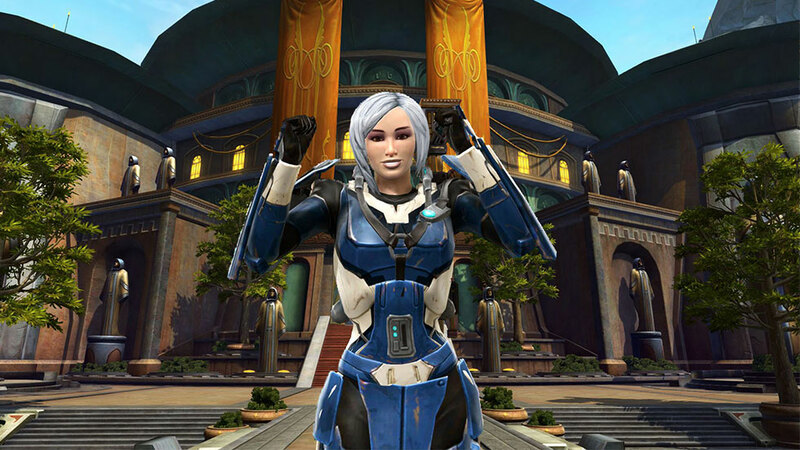 I'm working together with many different SWTOR content creators and community leaders, and together we've applied for a fan booth during the event and were accepted for an official fan table! While we're still waiting for more details from the event organizers, we're hoping to host meet & greets, livestreaming from the booth, some wonderful SWTOR Fan Community swag, and giveaways both online and off, of over 100,000 Cartel Coins and over 1 billion credits! So many players have been helping with this project and it's been delightful to organize everyone. I know how much I like the game already, but it's been amazing to see just how passionate other players are and to see how much time and effort they've put in to making this project happen! You can learn more about the SWTOR Fan Community project whether you are attending the Chicago event or not by visit swtorfancommunity.com - and for those of you who managed to snag tickets, I'll see you there! Lastly, are there any tips you’d want to give anyone out there that’s looking to create videos themselves? Creating videos is probably one of the hardest types of content creation - you must learn how to speak well, write well, edit audio and video, and on top of all that if you want to be successful you need to learn many other additional skills like search engine optimization. My biggest tip is "Do. Or do not. There is no try." One of the pitfalls I see many creator-hopefuls do is get stuck dreaming of all the things they want to do, but never buckling down and doing them! My second tip would be don't make Let's Plays as your first video, even if they are the easiest and sometimes the most fun! There are thousands of ways to share your personality without making a Let's Play series - Let's Plays are one of the least watched types of content for new video creators, so if you're hoping to be YouTube famous from just playing video games, you're in for a sad surprise. A short video that has a focused topic and doesn't have blank spots like Let's Plays often do, is a much better place to focus your effort and time if you are hoping to grow a YouTube channel - whether it's an opinion piece, a guide or a review. Third, quality matters. In my opinion and experience, one high-quality video will get you way further than ten low quality ones. Making high quality videos includes researching your topic, making sure your audio quality is very clear, and not throwing random footage in the background just to cover blank space. This can add hours to the video process, but it will get much better results - players are more likely to thumbs up, comment, or share on higher quality videos, which helps YouTube understand that they're worth recommending. Lastly, video editing is a lot of work. I have a few videos where I've probably spent 20+ hours of work on, when you include these steps: online research, in-game research, script writing, self-review, peer-review, audio recording, audio editing, in-game video recording, video editing, thumbnail creation, and video search engine optimization after uploading it to YouTube. Sometimes I skip some of these steps, or rush parts, and I often regret it later because unlike written guides, there’s no good way to edit in a correction to a live video. Of course, with all that said, make what makes you happy! If spending hours on a video sounds like all work and no play, do what seems fun to you! A lot of my enjoyment in making videos comes from being able to help other players enjoy the game more - so I'm always looking in to better ways to share my guides or increase the quality of my guide videos. Your joy might come from sharing your Let's Plays with friends, making some goofy low-quality meme videos, or sitting in front of a webcam and talking about how much you love playing your Sith Inquisitor. And if video making doesn't turn out to be your thing... you can always explore podcasting for pure audio, writing blogs or articles if you don't like recording, or streaming if you don't like editing! Good luck!